Please review the SAFARI Montage System Requirements to confirm your environment meets all stated requirements and then download the SAFARI Montage Media player. This installation guide assumes you have successfully completed the SAFARI Montage Update to Version 3.2.8 or greater, described in the separate document. If you have not updated your server(s) to version 3.2.8 or greater, please do so before proceeding with installation of the SAFARI Montage Media Player. 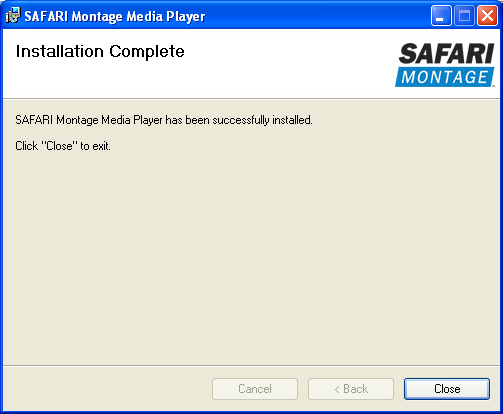 You may elect to distribute the SAFARI Montage Media Player to your clients by using your software distribution system. The SAFARI Montage Media Player installers for both Mac OS® X and Windows® support an unattended, silent mode to facilitate installation via industry-standard automated distribution systems. The Windows MSI package may be run in quiet mode to bypass the installation user interface entirely by running the msiexec.exe command-line utility with the /qn option. The Mac OS X package installer will run in silent mode automatically when distributed with Apple Remote Desktop. As with any unattended installation, it is recommended that you ensure all system requirements are met, thoroughly test your distribution packages, and confirm operation of the SAFARI Montage Media Player in your environment before proceeding with widespread distribution. 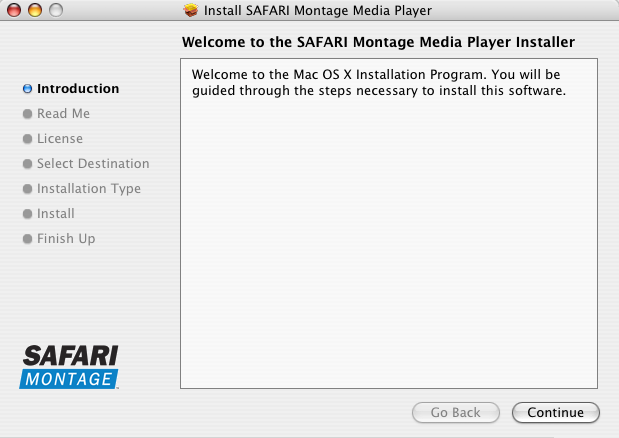 This guide provides end-user installation instructions for the SAFARI Montage Media Player. Please review the SAFARI Montage System Requirements to confirm your environment meets all stated requirements. To use the SAFARI Montage Media Player on Windows®, you need a PC running Windows XP® or Windows Vista® located on the same network as your SAFARI Montage server. You will also need administrative privileges to install on your computer. 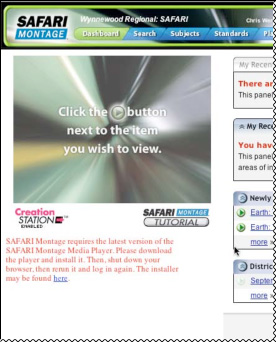 On the Dashboard, click on the link shown below to download the SAFARI Montage Media Player. 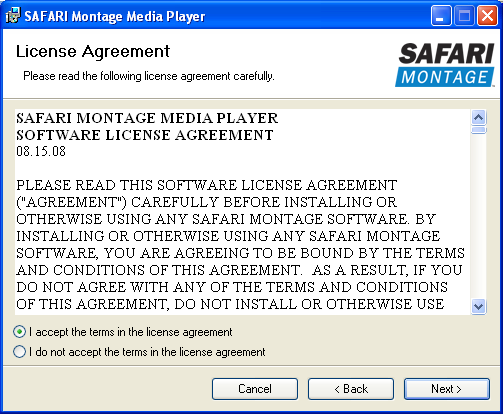 When prompted, save the SAFARI Montage Media Player setup file on your computer. (You may wish to save the setup file to your desktop, so you can easily locate it). Exit all web browsers that may be running before proceeding with the installation. 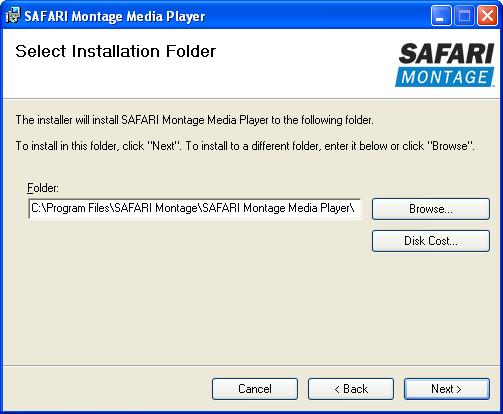 Launch the SAFARI Montage Media Player Installer by double-clicking on the file you've downloaded. 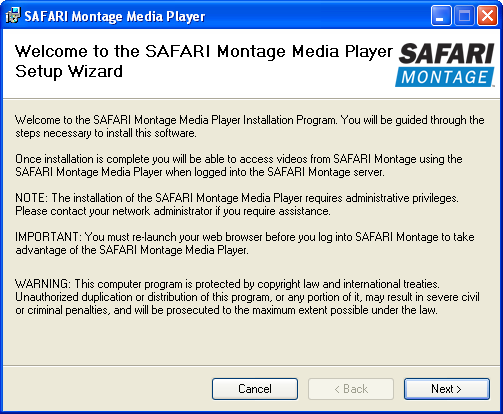 The SAFARI Montage Media Player Setup Wizard will appear and guide you through the rest of the installation. Click on "Next" to continue. Accept the default installation folder by clicking on "Next". You will be asked to agree to the End User License Agreement. Please read it carefully, and indicate your acceptance by selecting "I accept the terms in the license agreement" and clicking on the "Next" button. When the installation is complete, you will be presented with the confirmation screen. You can now use the SAFARI Montage Media Player by launching your web browser and logging into your SAFARI Montage account. Under "My Player Settings", confirm the "Video Player" is set to "SAFARI Montage Media Player"
If your network administrator has not installed the SAFARI Montage Media Player on your computer, you can download and install it on your local machine. To use the SAFARI Montage Media Player on Apple Macintosh©, you will need a Macintosh running Mac OS® X 10.3.9+ located on the same network as your SAFARI Montage server. On the Dashboard, click the link shown below to download the SAFARI Montage Media Player. When the SAFARI Montage Media Player file has finished downloading, it should launch automatically. If the installation does not launch, open your web browser's Downloads window and double-click on the SAFARI Montage Media Player Installer icon as shown below. 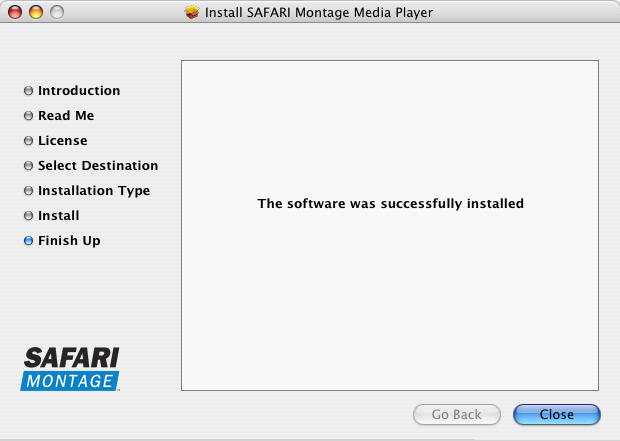 SAFARI Montage Media Player installer will appear and guide you through the rest of the installation. Follow the instructions on the screen, and the software will be installed for you automatically. You will be asked to agree to the End User License Agreement. 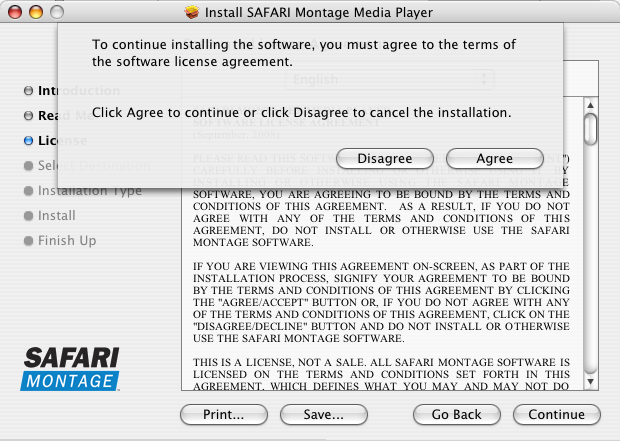 Please read it carefully, and indicate your agreement by pressing the Agree button.